Plants available from our Wenham nursery. Please contact us for further information. Many mature, specimen-quality plants are available. 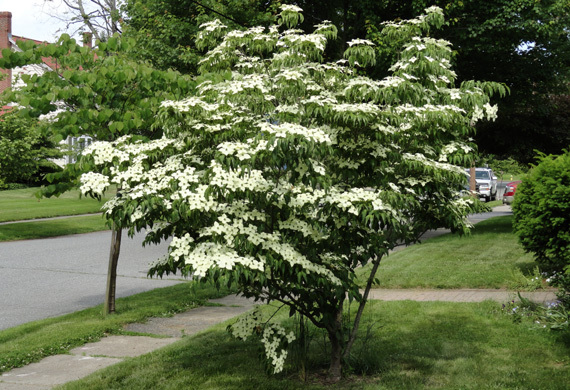 Kousa dogwood installed at a private residence. Since his childhood years, Hugh Collins’ fascination with trees has evolved into collecting and growing specimen trees and shrubs at his 4-acre nursery in Wenham, MA. Originally established to provide quality plants for select customers, the nursery is now available to the general public providing plants with outstanding characteristics representative of the species. Each tree and shrub available for purchase has been personally selected by Hugh Collins for its natural appearance, hardiness and overall quality. Many mature, specimen-quality plants are available for those “special” locations. Varieties include: Japanese Maples, Cypress, Stewartia and many more. These are dug-to-order, in-ground plants, not imports. If you are interested in acquiring nursery stock, we recommend personal, individual selection and tagging with the assistance of someone from our staff. Each plant has been individually inventoried, evaluated, and priced based upon species, size (maturity) and quality, so personal selection is highly recommended. Please use our contact page to request an appointment.